But in the instability created since the 2003 Iraq War they have developed autonomous areas in Iraq and Syria. The fight against ISIS has raised the possibility of breaking down imperialism’s borders. 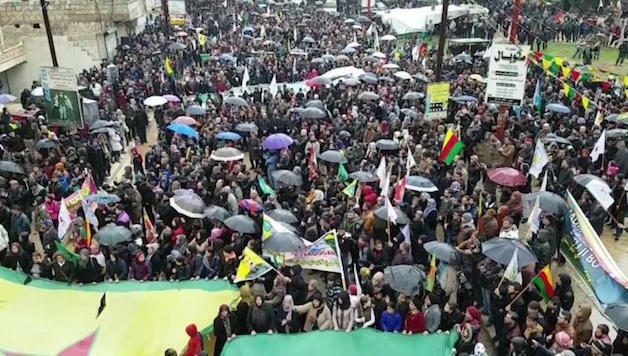 As a result of advances made by the Kurdish People’s Defence Force (YPG) in Syria (the fighting forces of the left-wing PYD – Democratic Union Party), a big conjoining area in both northern Syria and Iraq is under Kurdish control. All opposition parties and the media, which are fully in agreement with the Erdogan regime on this subject, show an extreme attention to the “fight against terrorism” as the reason for the operation, and in avoiding using the word “Kurdish” as much as possible (including some groups that define themselves as “socialist”). It is the reason for the quick change of the name of Rojava from a “Kurdish Corridor” extending to the Mediterranean into a “terror corridor”. Even the ultra-nationalist and racist MHP says “you cannot pretend that the MHP is against the Kurds”. Their real concern is the national consciousness formed around the Kurds. Previous articleThe Poor People’s Campaign at 50 – The Radical Legacy of Dr. Martin Luther King, Jr.